Nathan Hines is to join the Scotland coaching staff after deciding to retire at the end of the season, midway through a two-year deal with Sale. 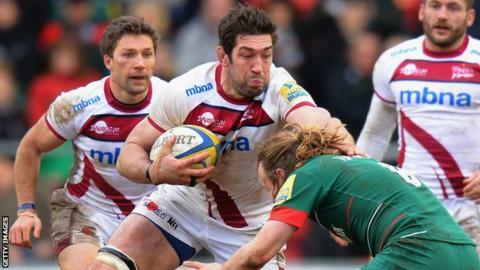 The 38-year-old former Scotland and British and Irish Lions lock will work as a "resource coach". He will add expertise in the area of line-out play, while supporting the development of younger forwards. Meanwhile, scrum coach Massimo Cuttitta has left for personal reasons after almost six years with Scotland. Capped 77 times, Hines announced his retirement from international rugby following the 2011 World Cup. He will help the squad prepare for this year's tournament before broadening his role to include pro teams Edinburgh and Glasgow, the newly-established academies and international age-grade teams. "This is a fantastic opportunity to help a team I played with for 11 years," said Hines, a Heineken Cup winner with Leinster in 2011. "I think that Scotland have got some exceptional young players and I'm relishing the opportunity to help make them better than they already are. "They've got huge potential and I want to help them in their development." Hines played under Scotland head coach Vern Cotter at Clermont Auvergne and is pleased to be linking up with the New Zealander again. "The chance to work with Vern again is another great benefit of this role," he added. "He knows how I work and I know how he works, which might have been part of the decision why he asked me to come on board. We got on really well at Clermont. "Part of helping the team mature is sharing my experience and showing them how not to make the same mistakes I did, on my travels, and in my 11 years playing for Scotland."